Here's a recommendation for those of you who watched the tragedy in Mumbai unfold and whose interest in the situation extended beyond the fact that much of the news was being reported via Twitter and other social media. 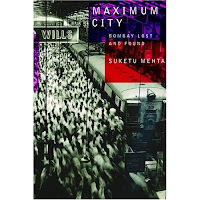 I picked up Maximum City a couple of years ago and found it to be one of the most enlightening books I've read in a while. The author, Suketu Mehta, is one of those modern men without a country-- he was born in India, emigrated to the US when he was around 14, and then, as a 30something adult, he returned to Mumbai with his Indian-American wife and two young sons as a reporter for a US magazine. Since most of his extended family still lives in Mumbai, he's not exactly lost there, but comes to realize just how American he's become. The book, which focuses on the not-exactly-intertwined lives of everyone from a transverstite dancer to a Bollywood star, offers a great overview of this booming city and he spends much time exploring the Hindu-Muslim violence that shook the city in the early 1990s and provides the backdrop of what happened last week. He spends a fair amount of time exploring the differences between the Indian and American psyches and one anecdote that still sticks out for me is when Mehta notices that even in the fanciest apartment blocks, the common areas are filthy. He attributes this to the fact that unlike Americans, who regard common areas as everyone's responsibility, Indians feel that their home ends at the doorway of their apartment and thus common areas are someone else's problem and fair ground for dumping garbage and cigarette butts. It's a small-but-crucial social difference and it's moments like this that give the book its true grace. Here's the link to buy this 2005 Pulitzer finalist on Amazon.